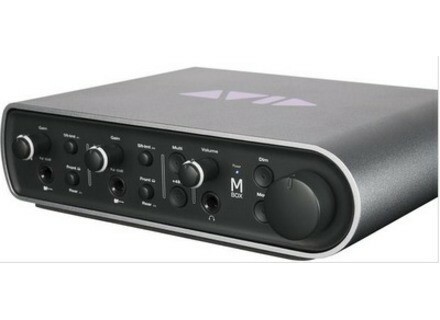 Mbox 3, USB audio interface from Avid in the Mbox series. Avid has released the Mbox 3, Mbox 3 Mini as well as a Mbox Pro. There are still no details on the Mbox 3 though, but the Mbox 3 Mini is a 24-bit/48kHz, USB bus-powered 2 x 2 interface. It has 1 XLR mic/line combo input with 48V phantom power, 2 -1/4" instrument inputs, balanced output, headphone out, a mix control for zero-latency monitoring, and monitor volume knob. The drivers are designed to ensure hardware compatibility with most major audio software (Logic, Live, Cubase, and more). The Mbox 3 Pro is a 24-bit/192kHz, USB bus-powered 8 x 8 interface. It has 4 XLR mic inputs with 48V phantom power, 4 x 1/4" TRS line inputs, 6 balanced outputs 2 unbalanced Alt line outputs, 2 x 1/4" headphone outs, onboard DSP, and an assignable Pro Tools multifunction button to give you access to software functions, and more. Here too, the drivers are designed to ensure hardware compatibility with most major audio software (Logic, Live, Cubase, and more). No details yet on a European release. Prices in the US are reportedly set at respectively $399, $549 and $749. Yamaha StageMix App StageMix is an application for the Apple iPad that allows remote control of M7CL mix functions via a simple, graphic interface from anywhere within wireless range.